Not to be confused with Desert Kingdom. 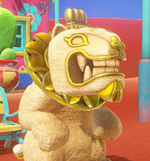 The Sand Kingdom is the third kingdom visited in Super Mario Odyssey. It is the greater location of Tostarena, which is a desert village featuring a small town and a large ruins area. This kingdom's main landmark is the Inverted Pyramid, which is an upside-down pyramid located in the north-east section of the area. When Mario first visits here, the kingdom is covered with large pillars of ice and Bowser is found atop the Inverted Pyramid. The player's first objective in this kingdom is to reach the "highest tower". From there, the player must find Moon Shards in the sand. After that, they reach the top of the Inverted Pyramid and fight Hariet, one of the Broodals, which will grant the player a Multi Moon. When collected, the player is teleported back to the Odyssey, and the kingdom cycles to a night-time version, where the Inverted Pyramid floats into the air, revealing a large hole underneath. The kingdom is also overrun by Chinchos during the night-time, which Mario must avoid as he heads to the large hole under the Inverted Pyramid. Once the player enters, he must traverse through an icy Underground Temple and then fight Knucklotec at the end of the Temple. Defeating this boss rewards Mario with another Multi Moon, which (when collected) reverts the kingdom back to daytime and causes almost all the ice on the surface of the kingdom to melt, allowing access to more Power Moons. Once Mario has collected enough Power Moons, he can head off to the next kingdom - either the Lake Kingdom or the Wooded Kingdom may be chosen, but not both at this point. 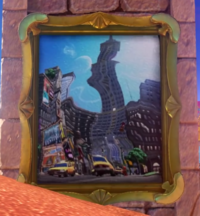 The Sand Kingdom was the first location shown in the game, dating back to the first Nintendo Switch reveal trailer. It is located east of the Cascade Kingdom, southwest of the Lake Kingdom, and northwest of the Wooded Kingdom. The location is primarily based off of Mesoamerica, particularly Mexico. However, other aspects allude to different countries, with Moe-Eyes inspired by the moai statues from Easter Island and the Jaxis presumably inspired by the komainu from Japan. 2.6 The Moe-Eyes love their shades. 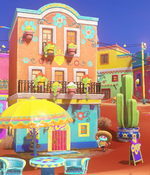 Tostarena was based on Mexico because the director of Super Mario Odyssey, Kenta Motokura, liked the country and his trip there had left a strong impression on him. Initially, it was considered whether Tostarena should be visited during the sunset. The sketch of the early design showed that the poncho and sombrero were already considered as the location's typical outfits, even though the motif of the sombrero was different and the poncho was supposed to be worn over Mario's usual suit and to be paired with boots. 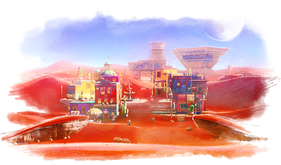 The concept art already included Tostarena Town, Tostarena Ruins and the Inverted Pyramid, as well as the ice pillars covering parts of the desert. The main visible differences are the town having just two rows of buildings forming one street while featuring a wooden gate at the entrance and the Inverted Pyramid being actually a floating pyramid resembling that of Chichen Itza. Some elements introduced in Tostarena, namely the Sphynx and the Moe-Eyes, were reportedly a reference to Super Mario Land, another game that features Sphinxes and Moai-like beings in a part-desert kingdom. Tostarena Town in particular was designed to create a contrast between the curved lines of the dunes and the more linear design of the buildings. Furthermore, the color of the building was chosen to reflect the cheerful nature of the Tostarenans. The concept art also shows that initially the town was supposed to have a bridge built over a road. On the other hand, the gate to Tostarena Ruins was designed to resemble an inverted triangle as a recall to the Inverted Pyramid. 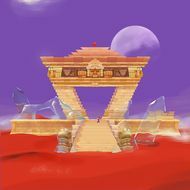 The concept artwork showed how the Power Moons of Tostarena were initially intended to be red instead of the final green color. The bright colors of Tostarena. A small town that serves as the hub for tourists planning to visit the Inverted Pyramid. The colorful buildings and cheerful people provide a warm welcome for visitors. They're happy to provide direction, so don't hesitate to say hello. The ruins greet you with an impressive gate. Head north from town and you'll be greeted by ancient ruins that dot the expansive desert. Though many have become conflict regions patrolled by Bullet Bills, their status as important heritage sites is undeniable. Like a precious gem itself. The true "can't miss" of this region, the Inverted Pyramid may look unstable, but rest assured it never topples and has thrilled tourists for years. It is said that a legendary artifact called the Binding Band lies within, and the upside-down pyramid symbolizes how those joined by it will never part even if the world turns upside down. Let's have a look at the curious local transport method known as the Jaxi. Just hop on the back of one, and as you might guess from their appearance, you'll be in for a wild but completely reliable ride. Make good use of them and you'll be exploring this unforgiving desert in comfort and style. So beautiful you'll think you're at a resort. Here's a spot to moisten your dried and withered heart, with greenery and water to make you forget you're in the desert. The fish and birds are plentiful and well worth a visit. The Moe-Eyes love their shades. They'll run if chased, but they're a proud people who have long inhabited these ruins. Please be polite. Sand Kingdom Slots Room Door In the building east of the Tostarena Town fountain A small room with a slots minigame. Three of the same picture must be lined up to win. Ice Cave Sinkhole At the northeastern part of Tostarena Ruins An underground area with icy, narrow platforms and moving columns. Sphynx's Treasure Vault Sphynx Behind Tostarena Ruins A small, golden treasure vault with many Coin Stacks and a treasure chest containing a Power Moon. Mario can only access this room after answering the Sphynx's question correctly. The coins do not reappear if Mario revisits the vault after he has already collected them. Rumbling Floor Room Warp Pipe On the balcony of the pink building northwest of the Tostarena Town fountain A small room where the player must locate a Power Moon by feeling a vibration from the floor through the controller. Dance Room Locked door guarded by a Tostarenan In the small tower at Tostarena Town's northwestern corner A small room with dancing Tostarenans where Mario performs a song on the stage to earn a Power Moon. Mario can only enter this room while wearing the sombrero and poncho. The Invisible Maze Red door Northeast of Moe-Eye Habitat on the other side of the chasm A temple-like area featuring an invisible path within corridors filled with poison and Moe-Eyes, which Mario must capture to reveal the path forward. The Bullet Bill Maze Red door At the Tostarena Northwest Reaches A maze-like area filled with poison which Mario must capture a Bullet Bill to traverse. Jaxi Ruins Underground Tunnel Underneath the Jaxi Ruins Checkpoint Flag An underground temple-like area filled with poison which Mario must ride a Jaxi to traverse. The Strange Neighborhood Mini Rocket On the northeastern building of Tostarena Town A platforming area featuring rotating building-like structures. When Mario arrives, he must throw Cappy onto a scarecrow to activate a road leading to the rotating platforms, then traverse them without Cappy's help. The Transparent Platforms Moon Pipe On the left raised platform in front of Tostarena Town A narrow area featuring invisible platforms and lifts over a wide chasm through which Mario must travel as a Moe-Eye. Colossal Ruins Moon Pipe At the Tostarena Ruins Entrance After capturing a spark pylon, Mario will arrive at a racetrack-like area over a sea of poison featuring several Rocket Flowers which Mario must use to get a Power Moon at the end, as well as grabbing a key to reveal another Power Moon before the ruins completely sink into the poison. Freezing Waterway Moon Pipe At the northeastern edge of the desert, east of the Inverted Pyramid and the Underground Temple entrance A tunnel-like area featuring pools of both poison and cold water. It also features Gushens, which Mario must capture to traverse. There are several places of cold water so Mario can regenerate the Gushen's water reserve. Atop the Highest Tower: The goal is to reach the top of the tower in the Tostarena Ruins. Moon Shards in the Sand: The goal is to collect the Moon Shards on the west side of the kingdom. Showdown on the Inverted Pyramid: The goal is to reach the top of the Inverted Pyramid and defeat Hariet. 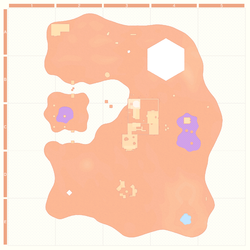 The Hole in the Desert: This objective takes place at night. The goal is to enter the hole beneath the Inverted Pyramid and defeat Knucklotec. There are two paintings in this kingdom. One can be found near the east side of the Tostarena Ruins, in a tilted pillar next to a Jaxi calling post. The painting leads to the Isolated Rooftop at the Metro Kingdom. It can only be accessed after completing the "Showdown on the Inverted Pyramid" mission. The other painting is located at the Southwestern Floating Island, which can be accessed from the Wooded Kingdom or the Lake Kingdom. The Sand Kingdom has green Power Moons. There are a total of 93 Power Moons (87 regular Power Moons and 2 Multi Moons) in the Sand Kingdom, the second-highest amount in the game after the Mushroom Kingdom. During the player's first visit to this kingdom, they can collect 59 of the Power Moons and the 2 Multi Moons. The player can also collect a Power Moon if they travel to this kingdom using a painting found in a future kingdom (either the Lake or Wooded Kingdom). One additional Power Moon can also be found when the player encounters the Tostarenan tourist in the kingdom (after he has visited all other locations). After the player defeats Bowser in the Moon Kingdom, 6 more Power Moons become available to collect. The Moon Rock will also be available to destroy, causing 20 additional Power Moons to be accessible. In order to progress to the next kingdom, the player must collect at least 16 Power Moons. The Sand Kingdom contains 100 regional coins, which take the form of triangles with designs of the Inverted Pyramid embossed on them. A new level inspired by the Sand Kingdom appears in the Nintendo 3DS and Nintendo Switch versions of Captain Toad: Treasure Tracker, which features miniature versions of the Tostarena Ruins, Inverted Pyramid and ice cave. Bullet Bills and Goombas appear as enemies in the level. A Pull Switch can be found on top of the Inverted Pyramid which causes it to rise from the ground and turn the level to nighttime. The Sand Kingdom also appears after the credits, where Captain Toad and Toadette arrive in a minecart. The Odyssey flies over, and Captain Toad chases after it. The kingdom was accidentally referred to as the Desert Kingdom in the Captain Toad: Treasure Tracker overview trailer, posted by Nintendo on their North American YouTube channel. The full Japanese brochure for the Sand Kingdom. Acchīnya From acchicchi, an expression for "hot" and burning. Spanish Soltitlán From Spanish sol (Sun) and Nahuatl suffix -titlán (place), which is commonly found in town names in Mexico. Atteurena From 아뜨/아뜨뜨 (an expression for hot or burning) and "arena"
↑ Brian (November 25, 2017). Super Mario Odyssey producer on approach to development, theme song, Pauline, higher age rating, more. Nintendo Everything. retrieved January 11, 2018. ↑ Post about the concept art of Tostarena's early design from the Japanese Super Mario Odyssey official Twitter account. Retrieved January 11, 2018. ↑ Game Informer Staff. (June 17, 2017). Mario's Developers On Hat Capture And Peach's Love For Mario. Game Informer. Retrieved January 11, 2018. ↑ 4.0 4.1 Post about the concept art of Tostarena Town's early design from the Japanese Super Mario Odyssey official Twitter account. Retrieved January 19, 2018. ↑ Post about the concept art of the gate to Tostarena Ruins from the Japanese Super Mario Odyssey official Twitter account. Retrieved February 7, 2018. ↑ Nintendo World Report TV. (June 17, 2017). Super Mario Odyssey - Jaxi Driving + Ice Ice Baby (DIRECT FEED). YouTube. Retrieved August 19, 2018. ↑ Nintendo (July 13, 2018). Captain Toad Treasure Tracker - Overview Trailer - Nintendo Switch. YouTube. Retrieved July 13, 2018. This page was last edited on February 26, 2019, at 13:13.